Huawei P9 was released as a new global flagship smartphone on last Wednesday, its big claim to fame is a pair of Leica-certified cameras. The 5.2-inch Huawei P9 has a traditional 12-megapixel camera, but right next to it is another, monochrome 12-megapixel module. Working together, the two sensors can improve contrast in photos by 50 percent and triple the light information taken in by the phone. Generally, transferring several songs from PC to Huawei P9 can be an easy job via Bluetooth or Wi-Fi. Or you can also use a USB Cable to transfer music from PC to Huawei P9. But what if you got hundreds even thousands of music to transfer? What should we do to make the music transfer more quickly and efficiently? Syncios Free Huawei Music Transfer would do you favor. As a professional music transfer designed for Huawei P9, it can be used to import music from computer to Huawei P9 with three steps. *Step 1*. Download and install Syncios on your computer and then connect your Huawei P9 to computer via USB cable. Step 2. Under My devices, click Media on the left panel, all of songs and detail information will be listed out as picture showed below. For importing music from computer to Android phones, like HUAWEI P9, it is possible to connect your phone to PC and use the mouse to drag the music items to the destination device because it would be read as a disk. If you tend to use another way, I think a thing called TunesGo can work for this case. It is a music manager to allow you to transfer music between phones and PC/iTunes. I am thinking Android Manager might help. Tried this Syncios, but did not work out so well. So, I google it and find this program. Importing music from the PC to an Android Phone, like Huawei, is one of the things it can do. Well, I'm done with all those tools, which are not designed for daily use. you're right. this app does not work well. whenever i tried it can't. Here suggest you to import music to Android phone from computer with a third-party program. Firstly, Install the software and connect your Huawei P9 to computer via USB sport. Then choose "Music"and mark what you like to import and click "Add" to begin. Now, songs that you have selected will be transferred to your Android device. Edit by Admin: Link to external website removed. 2: choose songs on computer. you are also allowed to directly drag and drop song from computer to Huawei P9. I could not do this no matter how hard I tried. I could not even get the computer to recognise the 32gB SD card I had brought. Then, I tried the connecting cable from a Logitech Harmony 600 remote control and now everything works perfectly. I don't know why but I saw online that they are different. I think there can be two methods to complete this task. 1. Connect your Huawei to computer and then your computer will detect your phone and shows you your data on your phone. Choose music on your phone and create a folder on your PC. Then you can copy and paste sons you like. 2. If you feel like to do this with an another easier way. You can search Android Transfer on RecoveryAndroid studio. It is a useful tool for you to transfer data from Android to PC. my friend has issue with transferMusic from Computer to Huawei P9 but i have sent this post to him and he has solved this issue. Thanks for sharing this, actually, there're many methods to import music from computer to android device. Nice trick but there are so many other tricks also avail to do this for sure. It could not be difficult to import the music form computer to Huawei P9, the best choice is to select a profeeional tool, and MobiKin Assistant for Android program can help you do this thing without any risk. You just connect the device to computer, and you will see a funtion of " Import" on the main interface, then make sure of the music that you want to import. Wait for a while, it is finished. We don't yet know if the OP is trying to transfer Gmail contacts. Even on Android phones, it's possible to store contacts locally on the phone and not in Gmail. Thanks for sharing this. I am using MusConv.com tool, and it also helps me to import my playlist from one player to another. First, using a USB cable. But it is slow sometimes. Thanks for sharing the useful information..
Hello, when you want to import the music file from computer to Huawei P9 phone, it is simple. Firstly, you should plug your phone into computer via usb, then wait for detection. 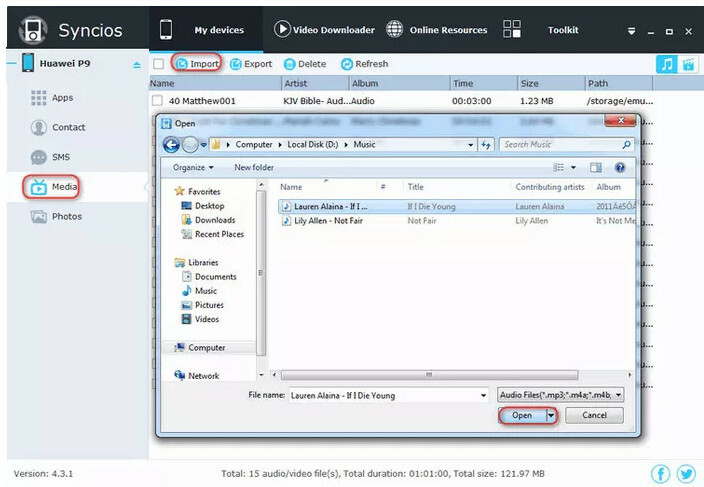 After connecting the device, it is time to move the music from download files to your phone directly. In order to prevent unlicensed sharing, iTunes digital files are encrypted by Fairplay DRM technology. But as for iTunes music, they have released from DRM protection from 2009. But if you would like to remove DRM from iTunes purchased music and transfer them to Honor 9, you can have a try of TunesKit Audio Converter, which can work on Apple music, iTunes music, audiobook, and more. Maybe you might like to remove DRM from iTunes movies and TV shows for watching them on Android devices. DRmare M4V Converter seems a smart choice for you to do that, since it can work at both iTunes rentals and purchases at 30X faster speed.